The 2018/2019 Lange SX 90 W was tested in the women's All-Mountain wide category at Silver Mountain Resort by the experts at America's Best Bootfitters, powered by Masterfit. The 2019 Lange SX 90 W returns this year without update, and apparently that's a good thing because it tied one other boot for the highest scoring women's boot in the test and only one men's boot scored higher. Last year's liner revision gave the SX 90 W a slightly more open-feeling forefoot and toebox and testers still noticed the difference and approved. 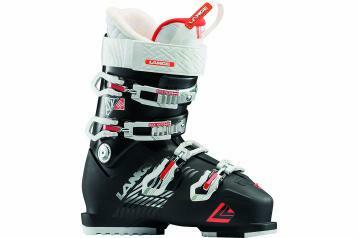 They liked that the SX was distinctly different, fit-wise, from the medium-width RX boot, but liked even more that it skied virtually as well for 200-bucks less! As with all the other Lange boots, the SX 90 W tapered fit to a more-snug heel and ankle pocket, testers said, though it did so in a softer, more relaxed sorta way than found in the medium and narrow Langes. One tester said that it was like the perfect burrito wrap—so long as there's enough foot filling. It is a high-volume fit with a particularly roomy fit in the toebox, instep and calf—all the spots where the high-volume skier is looking for a little extra relief. Testers said that in addition to an open calf fit at boot top, the cuff is slightly upright in its forward lean angle, which will even better suit women with larger calf muscles. Testers liked the easy, no worries roll from edge to edge in the SX 90 W. Neutral, predictable, stable and quick enough to get it done all around the mountain was the consensus here. Testers said the 90-flex was as billed—not a powerhouse, but neither was it a pushover for good skiing girls. At a list price of $550, the SX 90 W hits the value mark, but doesn't ski like a cheapskate. The top buckle catch offers quick, tools-free adjustment that's helpful for getting it buckled around a muscular calf. The replaceable Max Grip soles are slightly cushioned and have great traction for getting to and from the snow.